When people suffer from indigestion or heartburn, they usually reach for antacids. Unfortunately, most of them suffer from low stomach acid (hypochlorhydria), and that makes the problem even worse, especially in the long term. It’s also common for people who complain of symptoms of gastrointestinal reflux disease (GERD) to self-treat with antacids, or get prescription acid blockers to reduce their symptoms. Again, if the root issue is low stomach acid, that treatment can lead to additional health issues that may become more serious over time. What is not commonly understood is that the reason these people are suffering from poor digestion or stomach acid surging up their esophagus is that they don’t have too much stomach acid, they have low stomach acid. This means that their food doesn’t digest quickly… it hangs around, causing indigestion, a bloated feeling, and stomach acid lingering in the stomach long after it should have moved on to the rest of the digestive system. Belching and flatulence can be other uncomfortable symptoms of low stomach acid. This leads to the growth of unhealthy gut flora, because normal levels of stomach acid kill off the “bad” microflora (bacteria) in the top of the small intestine that don’t belong there. This increased bacterial growth can have a wide-reaching impact on your physical and even mental health. It also leads to poor nutrition, as there is insufficient stomach acid to properly process nutrients out of food consumed. Ulcers and gastroenteritis (infection of the gastrointestinal tract) can also increase when you have low stomach acid. Here at the Hong Kong Gut Health Centre, we understand the wide range of symptoms that can result from a digestive system that is out of balance – and how to correct it in the most effective and safe way. As you reach your 50’s, you may find that digesting your meals is more challenging, especially rich or large meals. Our stomachs tend to produce less stomach acid as we age, so indigestion becomes a common complaint. In fact, up to half of the population can have issues with low stomach acid as they age. 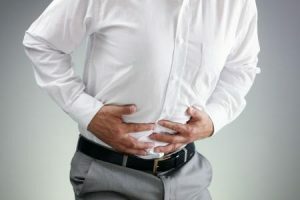 When you consume antacids or prescription acid blockers to deal with digestive distress that has low stomach acid as the first cause, you inadvertently make the problem even worse. A negative feedback loop takes place – your stomach acid is reduced even further, and although you may find temporary relief, your gut health is even further out of whack and you may have put yourself on the road to long-term nutritional deficiencies that will cause even more health issues in the future. When you don’t have enough stomach acid for proper digestion, food doesn’t get completely processed for nutrients. The first place poor nutrient levels are likely to occur is in your levels of zinc and vitamin B12. Treatment often includes assessing the nutritive status and supplementing with digestive enzymes and high-quality bioactive multivitamins. Try the simple test of drinking ¼ teaspoon of bicarbonate of soda mixed with a glass of cold water first thing in the morning. If you don’t belch within 2-3 minutes, chances are that you are low in stomach acid. If you think you have issues with low stomach acid, or are suffering from heartburn or acid reflux, call today to make an appointment. You can reach us at (+852) 2523 8044 or book online. We’ll help you get to the root of the problem and resolve it, instead of prescribing acid blockers that will mask the symptoms until they lead to even more serious health issues.